We specialize in all types of dust collection applications and have systems designed to properly capture virtually any industrial dust. Our dust collection systems are engineered and designed to meet OSHA and NFPA Standards, as well as your expectations. We can help make your plant cleaner, safer, collecting everything from fine dust to coarse particulate, sticky to explosive dust or fumes, grinding dust, sanding dust, shot blast dust, welding smoke, saw dust, rubber dust, lead fumes or dust, laser and plasma dust, and plastic fines, to name a few. Our Micro Air cartridge dust collectors are engineered for high efficiency filtration at lower costs. The patented Roto-Pulse™ filter cleaning system extends filter life, reduces maintenance costs, uses less compressed air and is substantially more efficient than typical back flush systems. Our HydroMax wet dust collectors are designed to capture combustible and explosive dusts safely and in compliance with OSHA and NFPA standards. The HydroMax units utilize water to safely collect aluminum, titanium, mixed metal and other volatile dusts. Our wet dust collectors comply with NFPA 484 in combustible dust applications without the addition of costly extra components required with traditional dust collectors, i.e. explosion vents, back-blast dampers, fast-acting valves, chemical isolation. 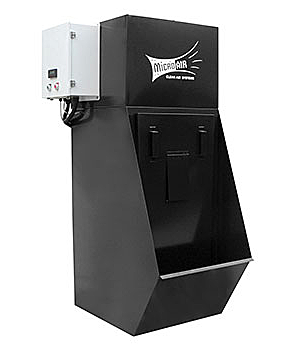 Available on all Micro Air dust collectors, the Intelli-Touch Control System includes a variable frequency drive which utilizes a soft start and ramp up of motor speed, eliminates sudden surges of power usage and reduces energy requirements. Systems can be set up to maintain a specific CFM or static pressure depending on your system parameters. All settings are controlled easily at the touch screen. By operating at the exact specifications your application requires, there is no wasted horsepower, compressed air or energy. It also allows for the maximum possible filter life, and built-in monitors give alerts for filter change-out. Our low-pressure, high-efficiency spark arrestors, which range from 2,000 CFM to 50,000 CFM, are designed to capture burning embers and sparks before they reach the dust collector. away from the collector’s filters and into a chamber to reduce the risk of a fire. Proper design of hoods and ductwork is one of the most important and most overlooked parts of a dust collection system. We can provide a properly sized dust collection system complete with engineering drawings and 3-D models. Our dust collection systems are designed to be efficient, economical and designed in accordance with the most current NFPA standards. 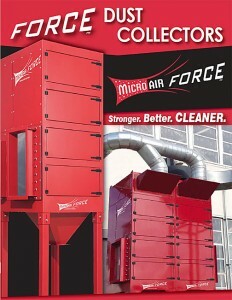 Click this link to download your copy of the Micro Air FORCE Dust Collectors brochure.